Looking for the best telescopic fishing rods for your extended hiking trip? Maybe you are planning to fly to your fishing destination and need something that will fit in your suitcase. No matter the reason, you will find all the information you need right here! What are the Benefits of a Telescopic Fishing Rod? There are plenty of reasons why you may want to buy a telescopic rod (also known as a collapsible rod). The most common are covered here. Compact: These kinds of rods are made to fit in small spaces. They are perfect if you have a 2-door vehicle or little storage space. Additionally, telescopic rods are perfect if you need to fit your gear in a backpack for a multi-day hiking trip. Lightweight: Since many fisher-people use these rods for hike-ins and travel, they were created to be super lightweight. Fishing gear can be heavy, and the last thing you want to do is add more weight with a rod. Affordable: This type of fishing gear was made to pack down for carrying, not to catch a salmon or a deep sea fish. Telescopic rods will get you the fish you need in a slow-moving body of water, lake, pond, and very rarely even surf. Beginner Friendly: Whether you are an opportunistic fisher or a regular beginner, you will appreciate the ease with which you can operate this type of rod. Telescopic rods are good to learn on without bogging you down with too many variables. This video gives you more of an idea of when you would want to use a telescopic versus other types of rods. For a more in-depth comparison between 1-piece, 2-piece, and collapsible rods, Outdoor Empire has you covered. What Materials Should You Look For? There are two primary types of materials used to make collapsible fishing rods: graphite (carbon fiber) and fiberglass. You can also find telescopic gear that uses stainless steel on the reel seat. So, what are the benefits and drawbacks to each? Let's find out! Graphite Pros: Those that are more advanced in their fishing abilities will appreciate graphite rods. This material is extremely sensitive, yet it is extremely strong. Great conditions to use live bait or jigs. Add a braided fishing line to achieve maximum sensitivity to fish bites! Graphite Cons: The biggest drawback to graphite rods, especially for beginners, is the sensitivity. Any little thing can feel like a nibble, so beginners may find themselves frustrated while they learn the difference. It also isn’t the best if you plan to troll at all. Fiberglass Pros: Fiberglass works best when trolling, vertically jigging, and using crankbait. These types of fishing do not call for much sensitivity. Typically, this material comes with soft to medium action. Some feature faster action but don’t expect great recoil. Fiberglass Cons: Fiberglass telescopic fishing rods are typically heavier than graphite because they are thicker. If you plan to spot cast or drop shot, fiberglass blanks aren’t the best due to their lack of sensitivity. What are the Other Important Factors? When deciding on the best telescopic fishing rod for you, there are three other important factors to consider. These are the durability, weight, and length of the rod. Durability: The strength of the rod is important because you will be opening it and collapsing it often. If you purchase a lower quality product, chances are it won’t last very long. Even with durable materials, you should still be careful opening it. Weight: Since most telescopics are lightweight, this shouldn't be too much of an issue. Just be aware the longer the rod, the heavier it will be. Also, keep in mind how heavy the rest of your supplies will be. Length: The length you want to choose depends on where you want to fish, what you want to fish, and your size. For more advice on choosing a length, Bass Master has you covered. Spinning, Surf, or Fly Rod? Let’s take an in-depth look to help you decide. Spinning: Rods made for spinning reels are by far the most popular among anglers. You can use this telescopic in the greatest amount of places: rivers, streams, ponds, and lakes. Just make sure you set your sites on fish the rod can handle! Surf: To take your rod into the surf, it must be on the more durable side. It should also have anti-corrosive properties to protect against the saltwater. A good sized length for surf fishing is anywhere from 10 to 15 feet. Fly: Telescopic fly fishing rods are a rare find, but they do exist. You want there to be no handle past the reel so you can work your wrist. Additionally, the whole thing should be flexible as well as thin. Of all five best telescoping fishing rods, the KastKing Royale Legend takes the gold. This high-quality rod was designed specifically for bass fishing. It is rare to find a telescopic rod that can also hold larger fish, so traveling bass fishers take notice! KingKast gives you a choice between spinning and a casting rod, and 1 or 2-pieces. You may decide to get one of each for every bass fishing occasion! You can even specify your length and power. All of the rods are created from Toray 24-ton carbon fiber. To make this lightweight piece of gear stronger, KingKast added blanks with KastFlex technology. This also helps the 2-piece perform smoothly. If this is your first telescopic fishing rod purchase, you don’t have to worry. The Royale Legend is covered by a limited lifetime warranty. This covers the materials and workmanship, so you can feel comfortable making a good decision! The yellow Eagle Claw PK55SP Pack-It is the best value of the five on our list. While not made of graphite or fiberglass, the Pack-It uses durable glass with ceramic guides and a graphite reel seat. This is different than most rods, but some anglers swear by this construction—it's part of the reason we rank it as one of the best telescopic fishing rods. The length of this rod is 5-feet and 6-inches, making it one of the shorter spinning rods. However, this is good for people who are shorter or not as strong. In fact, this would be a great first telescopic fishing rod for an adolescent. The graphite reel seat is a nice addition because fishers know they can trust the strength of graphite. In all, this on-the-go collapsible fishing rod only weighs 5.6 ounces. For anyone spooked by the primary glass design, Eagle Claw offers a 1-year warranty. The TROUTBOY Black Warrior is the best telescopic fishing rod made of both 24-ton carbon fiber and fiberglass. This combo gives you some of the best of both worlds. You get sensitivity and a durable rod at the same time! In terms of length and power, TROUTBOY allows you to choose. You can pick a length anywhere from 5-feet and 10-inches to 10-feet and 10-inches. The lightest weighs only 5.1 ounces, while the heaviest comes in at 10.9 ounces. Just be aware all rods are fast action. If you want a telescopic rod to take out to sea, the Black Warrior may be what you are looking for. Its reel seat is made of aluminum so that you can take it into salt water. In case you are on the fence, TROUTBOY offers a 6-month worry free warranty on their Black Warrior rods. 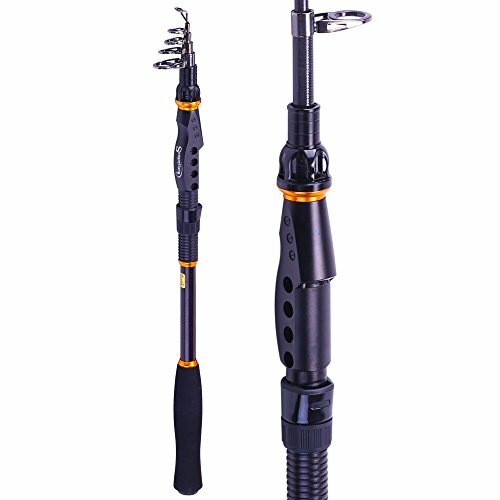 The Sougayilang Black Hawk Fishing Rod gets the title of the most durable telescopic fishing rod due to its materials and design. Made of 24-ton carbon fiber, this fishing rod also has the bonus of E-glass composite for greater power. In terms of size, you can pick between 6 different sized rods. The shortest is 5.91 feet, and the longest is 11.81 feet. You are sure to find a length that meets your fish size and bait needs! 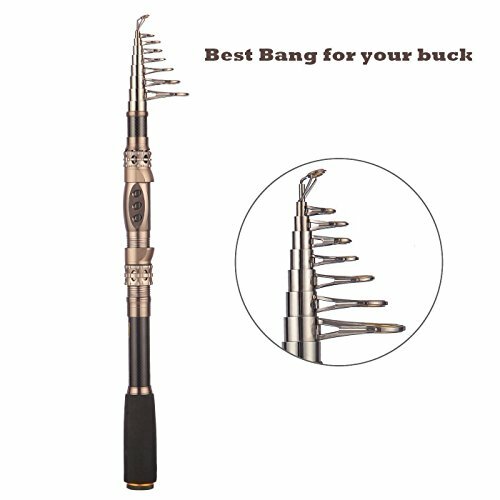 Additionally, each of Sougayilang's Black Hawk rods come perfectly balanced. Anyone interested in taking their telescoping rod into saltwater can count on the Black Hawk. The reel seat was created from CNC machined aluminum that will keep the corrosion away. The best part is you can use this rod whether you want freshwater Bass or a saltwater dinner! Although 2 of the other rods on this list can handle saltwater, only one can handle the surf the best. The PLUSINNO Telescopic Fishing Rod was created to do just that! It is even made of durable carbon fiber and fiberglass composite to resist corrosion. One unique feature of these rods that make them perfect for surf is the aluminum oxide material used on the guide inserts. This along with the stainless steel hooded reel seats are sure to protect this telescopic rod from the power of saltwater. As far as length goes, you have your choice of 5: 5.91 feet, 6.89 feet, 7.78 feet, 8.86 feet, or 9.84 feet. 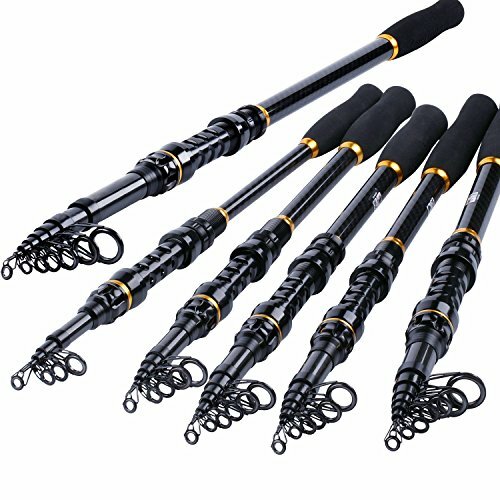 The power of each of these rods is medium, so you can feel comfortable catching small to medium sized fish in the surf.